My husband and I visited Turks and Caicos about 15 years ago and fell in love with Grace Bay. We have been married for 44 years and over these years we have been very fortunate to be able to travel. Growing up, we did not have the opportunity to travel much, so on our first ventures outside the United States, we were taken away by the beauty of the countries and islands. Even more, we realized how blessed we were to live in America. We have two grown children and six beautiful grandchildren ranging in ages from 6 to 14. I was once told that traveling and seeing different parts of the world with your kids is the greatest thing you could ever do for them and for yourself. Keeping that in mind, two years ago my husband and I decided we were tired of buying Christmas presents that many times were soon forgotten. We decided instead to gift the entire family a trip to our favorite island, Turks and Caicos, thinking this would be the greatest gift we could ever give and would be remembered forever. Our first family trip in 2014 was fabulous, but we never left the resort! Returning home, I began to think about the fact our grandchildren had not been exposed to any of the culture of the island. I decided that on future trips we need to inspire our grandchildren to leave the resort and gain a broader perspective of the lifestyles and culture, helping them realize that our responsibility to help extends far beyond our own family and community. My hope was this would also teach them to become ethically and morally responsive to different cultures. A few months later I began to research organizations that could make a difference on our next trip. I was truly blessed to have found an article about Pack for a Purpose. I was so excited when I discovered that not only was Turks involved, but Beaches Resort where we were staying was a drop-off location. Perfect! 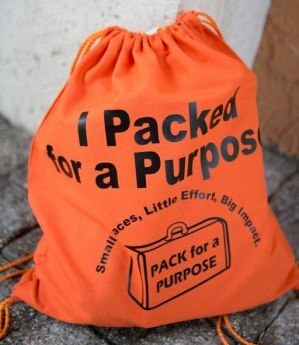 I started telling all our grandchildren about Pack for a Purpose and that I was going to have shirts and bags with the logo made for them. My thought about the shirts and bags was if they wear them traveling in the airports people might ask them about Pack for a Purpose. That would give them the opportunity to explain their mission and why they were involved. At first I could tell their little heads where thinking, “We will have to lug the school supplies all the way to Turks?” Our nearest major airport is 200 miles away, so we drive and then fly, making travel days very long for us—especially the kids. Several months before our departure they began shopping for school supplies to fill their bags. The kids began to get somewhat excited, but I could still tell they were not quite sure why they were doing this. The grandkids kept asking if they could actually take their bags to the school, so I decided I would ask if that was possible. When I met with Elanor, the very sweet PR manager at Beaches, I instantly became a bragging grandmother. 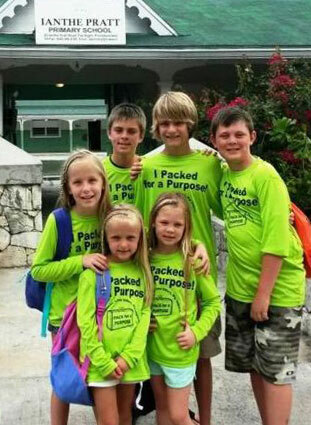 I explained I had six beautiful grandchildren who all had shirts and bags saying “I Packed for a Purpose” on them, and that they wanted to deliver their bags to the school. She was genuinely kind and said she would make a few calls to see if she could accommodate my request. I was so grateful and excited when she told me she had arranged for them to visit the school. What a lasting impression this made on each of our grandchildren. It made having to “lug” their bags all the way from Western Nebraska worth all their effort. Each one said they wish they would have brought more. They really understood why they Packed for a Purpose. The children have not stopped talking about their visit, and they are already planning what they are going to take next year. It was the highlight of their trip to Turks. Lily, who is 9, said she is now more appreciative for all she has in school and at home, and wished she would have taken more books for their library. The grandchildren also said they wished they could have stayed at the school longer and participated in more activities. We had another wonderful family vacation in Turks, but this one was much different than our first trip because we had a purpose. Packing for a Purpose will be what our grandchildren will remember most about this vacation. It was a family experience that we shared and will be able to share with others forever. We all agreed no matter where are travels may take us as in the future, we will be Packing for a Purpose. Our entire family extends our sincere thanks to all those who have made Pack for a Purpose possible, impacting the lives of so many across the world and here in our own country—it certainly impacted ours!